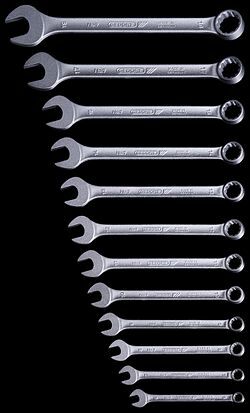 A wrench (or spanner) is a tool used to provide grip and turn nuts and bolts, and similarly shaped objects. In British English, spanner is the standard term. The most common shapes are called open-ended spanner and ring spanner. The term wrench is generally used for tools that turn non-fastening devices (e.g. tap wrench and pipe wrench), or may be used for a monkey wrench – an adjustable spanner. What a wrench or spanner does is to grip. Pulling or pushing the handle to rotate gives mechanical advantage. It applies torque to turn objects – usually rotary fasteners, such as nuts and boltss – or keep them from turning. An adjustable spanner, or adjustable wrench, or crescent wrench in American English, is a tool. It may move its jaw to rotate nuts or bolts of different sizes. It was invented by Edwin Beard Budding (1795–1846), who also invented the lawnmower. This page was last changed on 15 January 2017, at 15:24.